Six months from now, detailed schematics anonymously uploaded to the Internet will describe, in perfect detail, how to build a faster-than-light engine for $200 in easily-available parts. Space travel will become instantly―and chaotically―democratized. The entire cosmos will be within reach of all humankind. This is what happens next. 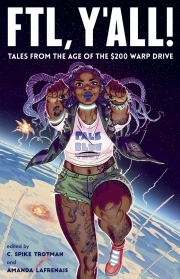 In this visionary science fiction anthology, a striking array of new voices from across the field of comics tackles humanity’s biggest questions with a disarmingly small prompt: what would happen if we could escape?